We are dependent for the story of these earliest days of the Church's life upon the Acts of the Apostles. I have endeavoured, however, to illustrate the narrative by copious references to ancient documents, some of which may appear of dubious value and authority, such as the Ads of the Saints and the writings of the mediaeval Greek hagiologist, Simeon Metaphrastes, who lived in the tenth century.3 The latter writer has been hitherto regarded as more famous for his imagination than for his historical accuracy. This age of ours is a noted one, however, for clearing characters previously regarded as very doubtful, and Simeon Metaphrastes has come in for his own share of this process of rehabilitation. The distinguished writer just referred to, Dr. Lightfoot, as we have shown in a note on p. 218, has proved that Metaphrastes embodied in his works valuable early records, dating back to the second century, which in critical hands can shed much light upon primitive Christian history.4 In fact, students of Holy Scripture and of early Christianity are learning every day to look more and more to ancient Greek, Syriac, and Armenian writers, and to the libraries of the Eastern Churches, for fresh light on these important subjects. It is only natural we should do so. Writers like Simeon Metaphrastes and Photius, the student Patriarch of Constantinople, lived a thousand years nearer the apostolic times than we do. They flourished in an age of the highest civilization, when precious literary works, in hundreds and thousands, which are no longer known amongst us, lay all around them and at their command. These men and their friends gathered them up and extracted them, and common sense alone teaches that a critical study of their writings will reveal to us somewhat of the treasures they possessed. The libraries of the East again form a great field for investigation. During the last fifty years we have paid some little attention to them, which has been amply rewarded. The recovery of the complete works	of Hippolytus and of Clement of Rome, the discovery of the Teaching of the Apostles and of the Diatessaron of Tatian, are only specimens of what we may yet hope to exhume from the dust of ages. I need not go farther into the story of the recovery of this document, which raises high our expectations of others still more interesting. The Apology of Quadratus would be even more important, as it bore direct testimony to the miracles of our Lord. The brief extract from it which Eusebius gives in his History, book iv., chap. 3, proves how precious would be the complete work. "The deeds of our Saviour, says Quadratus, were always before you, for they were true ; those that were healed, those that were raised from the dead, who were seen, not only when healed	and when raised, but were always present. They remained for a long time, not only whilst the Saviour was sojourning with us, but likewise when He had been removed. So that some of them have also survived to our own times." In the Apology of Quadratus we should obtain a picture of the popular theology of the Church during that dark period which elapsed between the days of Clement of Rome and Ignatius, and those of Justin Martyr. The Apology of Aristides which has been found reveals something indeed in the same direction, but is more occupied with an attack upon paganism than in a statement of the Christian faith. Here, however, consists its bearing on the Acts of the Apostles, not directly, but by way of contrast. Let me explain what I mean. In lecture xvii., when treating of the story of Simon Magus, I have shown how the simple narrative of the Acts concerning that man became elaborated in the second century till it formed at last a regular romance ; whence I conclude that if the Acts had been written in the second century the story of Simon Magus would not be the simple matter we read in St. Luke's narrative. Now our argument for the date of the Acts derived from the Apology of Aristides is of much the same kind. This document shows us what the tone and substance of second century addresses to the pagans were. It is the earliest of a series of apologies extending over the whole of that century. The Apology of Aristides, the numerous writings of Justin Martyr, specially the Oratio and the Cohortatio ad Græcos attributed to him, the Oration of Tatian addressed to the Greeks, the Apologeticus and the treatise Ad Nationes of Tertullian, the Epistle to Diognetus, the writings of Athenagoras, all deal with the same topics, the theories and absurdities of Greek philosophy, the immoral character of the pagan deities, and the purity of Christian doctrine and practice.7 If the Acts of the Apostles had been composed in the second century, the address of St. Paul to the Athenians would have been very different from what it is, and must necessarily have partaken of those characteristics which we find common to all the numerous treatises addressed to the heathen world of that date. If the Acts were written in the second century, why does not the writer put arguments into St. Paul's mouth like those which were current among the Christian apologists of that time ? The philosophical argument of Aristides, which is followed by Justin Martyr8 and the later apologists, when contrasted with the simplicity of St. Paul, is a conclusive proof of the early date of the composition of the Acts.9 But this is not the only argument of this kind which modern research furnishes. Aristides shows us what the character of Christian controversy with the pagans was in the generation succeeding the Apostles. We can draw the same conclusion when we examine	Christian controversy as carried on against the Jews of the same period. We have a number of treatises directed against the Jews by Christian writers of the second century : the Dialogue of Justin Martyr with Trypho the Jew, of Jason and Papiscus, and the treatise of Tertullian directed Ad Judceos. When compared with one another we find that the staple arguments of these writings are much the same.10 They were evidently framed upon the model of St. Stephen's address at Jerusalem, of St. Paul atAntioch in Pisidia, and of the Epistle to the Galatians. They deal with the transitory and temporary character of the Jewish law, they enter very largely into the fulfilment of Old Testament prophecy, and they notice Jewish objections. The second century works are, however, elaborate treatises, dealing with a great controversy in a manner which experience had showed to be far the most effective and telling. The Jewish controversy in the Acts, whether in the mouth of St. Peter, St. Stephen, or St. Paul, is treated in a much simpler way. The speakers think, speak, write, like men who are making their first essays in controversy, and have no experience of others to guide them. Had the Acts been written in the second century, the writer must have composed the addresses to the Jews as well as those to the Gentiles after the model of the age when he was writing. The more carefully, however, we	examine and contrast these two controversies, as conducted in the Acts and in the writings of the second century respectively, the more thoroughly shall we be convinced of the apostolic date of St. Luke's narrative, of its genuine character, and of its historic worth. I have written this book from my own standpoint as a decided Churchman, but I hope that I have said nothing which can really hurt the feelings of any one who thinks otherwise, or which may tend to widen those . differences between Christians which are such a terrible hindrance to the cause of true religion and its progress in the world. I have tried to use the Revised Version consistently throughout my expositions, but I fear that my attempt has been but vain. In my formal quotations I think I have succeeded. But then, in commenting upon Scripture, a writer constantly refers to and quotes passages without formal reference. Here is where I must have failed. The Authorized Version is so bound up with all our earliest thoughts and associations that its language unconsciously colours all our ideas and expressions. Any one who at present makes such an attempt as I have done will find illustrated in himself the phenomena which we behold in writings of the fifth and sixth centuries. St, Jerome published a Revised Version of the Latin translation of the Scripture about the year 400 a. d. For hundreds of years afterwards Latin writers are found using indiscriminately the old Latin and the new Latin translations. St. Patrick's Confession, for instance, was composed about the middle of the fifth century. Quotations from both versions of the New Testament are found in that document, affording a conclusive indication of its date ;	just as the mixture of the Revised and Authorized Versions will form a prominent feature in theological works composed towards the close of the nineteenth century. I have to acknowledge the kind assistance of the Rev. H. W. Burgess, LL.D., who has patiently read all my proofs, and called my attention to many a solecism or mistake which might have otherwise disfigured my pages ; and of Mr. W. Etienne Phelps, B.A., deputy keeper of Primate Marsh's Library, who has compiled the index. See the treatise on the Christian Ministry in his Philippians, p. i86. 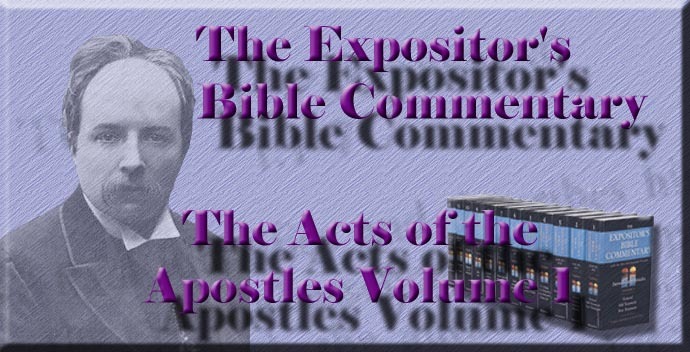 Dr. Goulburn, in his Acts of the Deacons, suggested this view of the Acts of the Apostles nearly thirty years ago. For an account of Simeon Metaphrastes the English reader should consult Dr. Schaff's valuable Encyclopedia of Historical Theology. See Professor Ramsay on "The Tale of Saint Abercius " in the Journal of Hellenic Studies, vol. iii., p. 338, for a full account of this new source of early Church history which his travels and excavations have brought to our notice. Ceillier, Hist, des Auteurs Ecclésiastiques, i., 403. Mr. Harris's discovery is not the first find of this ancient apologist in modern times. The Armenian Mechitarites of Venice published what they called two sermons of Aristides in 1878; which Cardinal Pitra, the learned librarian of the Vatican, reprinted in 1883, in his Analecta Sacra , t. iv., pp. x, xi, 6-11, 282-86. One of these sermons was a fragment of the Apology of Aristides, which the Mechitarites scarcely at first recognised as such. M. Rénan, in his Origines de Christianisme , vol. vi., p. vi (Paris, 1879), scoffed at this fragment, declaring that, from the technical theological terms, such as Theotokos, therein used, it was evidently posterior to the fourth century. Doulcet, in the Revue des Questions Historiques for October 1880, pp. 601-12, made an effective reply with the materials at hand at the time; but Mr. Harris's publication of the complete work triumphantly demonstrates that M. Rénan's objections were worthless (see Harris, pp. 2, 3, 27). It is another proof that Christians have everything to hope and nothing to fear from such discoveries of early documents. Mr. Harris's preface is specially interesting, because it shows that we have had the Apology of Aristides all the time, though we knew it not, as it was worked in the quasi-oriental tale of Barlaam and Joasaph printed among the works of St. John of Damascus. The apologists of the second century will be found in a collected shape in Otto's Corpus Apologetarum, in nine vols. (Jena, 1842-72). Most of those mentioned above will be found in an English shape in Clarke's Ante-Nicene Library. See also Harnack in Texte und Untersuchungen, bd. i., hft. i. (Leipzig, 1882). St. Jerome, in Ep. 70, addressed to Magnus, a Roman rhetorician, expressly says that Justin Martyr imitated Aristides. The Cohortatio ad Gracos attributed to him is much liker the treatise of Aristides than Justin's admitted first and second apologies. For an account of the Jewish controversy in the second century see Gebhardt and Harnack's Texie, bd. i., hft. 3 (Leipzig, 1883), where Harnack seeks to critically restore the substance of the dialogue between Jason and Papiscus. An article on "Apologists " in the Dictionary of Christian Biography, vol. i., pp. 140-47, and another on " Theophilus " (13) in the same work, vol. iv., p. 1009, should be consulted.